Bicyclists pedal, above, toward Yerba Buena Island from Oakland on the bike path along the eastern span of the Bay Bridge. Jesse Flores, below, opens the island gate to the path, now open on weekdays. The Bay Bridge bike path, which used to go part of the way part of the time, now goes part of the way almost all the time. It’s complicated. Everything about the eastern half of the Bay Bridge is complicated. 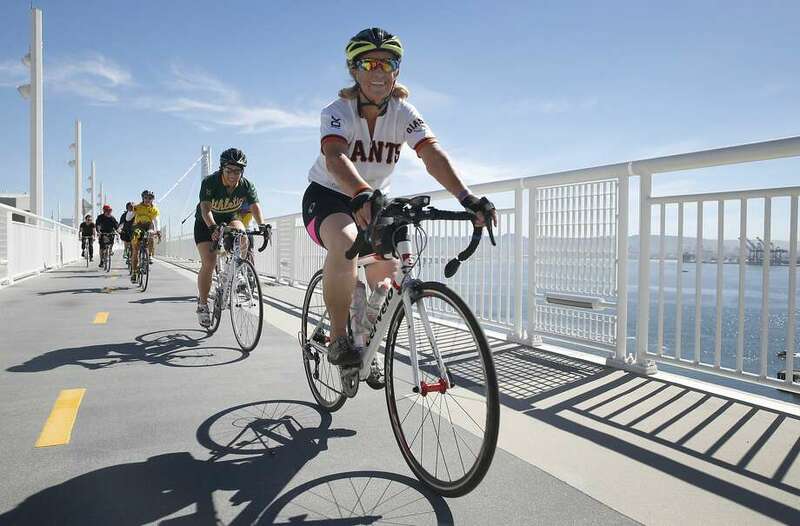 The 2.2-mile bike path is now open from Oakland to Yerba Buena Island seven days a week. Before that, it was open only on weekends. Before that, it was open only partway across the bridge. Before that, it wasn’t open. Tuesday was the perfect day to take a ride from Oakland to wherever it was. The sky was blue and the plastic grass at the new vista point was green. The bridge staff was so happy to open the path to weekday pedalers and walkers that it threw a big party and invited Oakland Mayor Libby Schaaf to ride over from Oakland for free brownies. Schaaf borrowed an $1,400 electric bike so she wouldn’t have to actually turn the pedals, the path to Yerba Buena Island being uphill. Robby Palermo, a salesman with the Genze electric bike company, said Schaaf had used half the battery charge on the loaner bike to propel herself out of Oakland. The new bike path ends at the vista point, where pedalers find a portable toilet, a drinking fountain, a few benches, a patch of plastic grass and a wall of plastic ivy to separate the bikers from Coast Guard lodging next door. Designers opted for plastic grass, said project engineer Jacob Jones, because a small patch of real grass would probably be trampled into mud by all the cyclists. At the vista point, the vista is about all there is. After taking it in, a cyclist is advised to turn around and return to Oakland. Continuing to Treasure Island is a challenging ride on a busy, steep, narrow road. 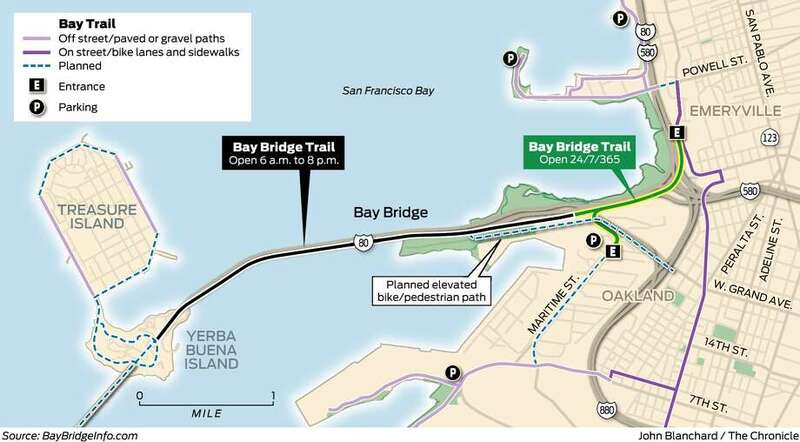 And continuing to San Francisco isn’t possible until somebody figures out how to jury-rig the promised second half of the bike path onto the suspension span, and how to pay for it. That probably won’t happen for at least 10 years, according to a spokesman for the Metropolitan Transportation Commission. Most cyclists who tried the path Tuesday, on its new midweek operating schedule, said the views made the trip worthwhile. “It’s a beautiful ride to get here,” said Juan Montes of Richmond. “Once you get here, there’s not a lot to do except keep going,” said his wife, Margarita Contreras, which is what they did, on a Muni bus, to San Francisco. For now, the bridge is offering a free shuttle van to take cyclists and their bikes from the vista point down the hill to Treasure Island. But even though the bike path is now open daily, from 6 a.m. to 8 p.m., the free shuttle operates on weekends only.